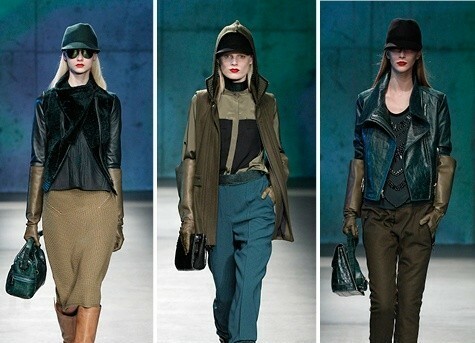 For the first time in seven years, Kenneth Cole displayed the brand’s collection for Fall 2013 in all its edgy glory. With pieces flaring what Vogue called out as an urban warrior style, the runway filled with fur trimmed jackets, shadowing hoods and hats, thick vests, combat boots and many pieces even boasting reflective panels. Styles were heavily layered, creating a protected look with an air of aloof mystery. With a nod to his time away from the runway and to what had occurred in his absence, the beginning of the show featured a video with taglines like “Yield to Social Netwalking,” and “We don’t care if people love it, we just want them to ‘like’ it”. Models holding laptops and clearly checking cell phone messages as they strode the runway, perhaps responding to the tweets that celebrated them. The Kenneth Cole collection for 2013 was displayed in light of society’s growing attraction to social media and the technology that supports it. Returning to fully embrace the influence social media has had and will continue to have on all industries, the entire night was in fact a herald to the social media scene. Every tweet, facebook mention and pin were strongly encouraged. In fact for every tweet hashtagged #KCRunway by an @KennethCole follower, the label donated $1 to amfAR. Adding to this generosity, the proceeds from sales of the runway exclusive black python clutch done in collaboration with Sarah Jessica Parker was being sold through the show’s livestream. And 100% of the sale was given to the AIDS-research charity, the same one who honored Cole himself at a previous event. Birds flew against the wall of building sillhouettes and telephone poles in a truly New York-like urban setting, eliciting a sense of dangerous freedom embodied in the striking styles. In sharp contrast to the perky blues and reds representative of the most up-and-coming social media sites, the clothes of that evening were dark. Blacks and greys and other somber neutrals perhaps spoke to the transition of social media from teenage games to adult reality. 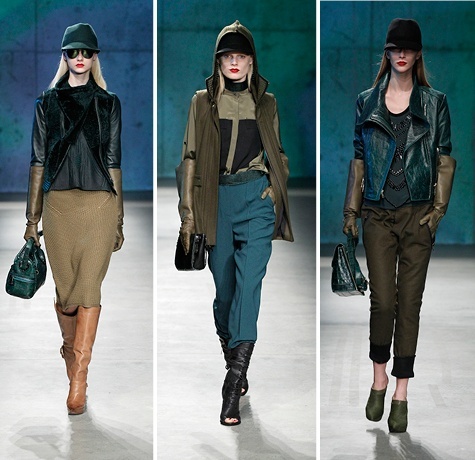 The hunter greens, deep reds and navy hues that did show up were distinctly suave and appeared more action oriented. Kenneth Cole’s explosive return to the runway could not have been more favorably met. His appearance on the stage at the end was enthusiastically received and the numerous contributions to charities his label engaged in earned him equal association as philanthropist, not just designer. Mercedes-Benz Fashion Week knew exactly how to define the chemical magic that was created by Diesel Black Gold’s Fall 2013 NYFW production: as a “love affair between refined quality and rock & roll”. And indeed the leather and fringe-filled show had plenty of rock to spice up the high style of Diesel Black Gold’s renown. A plethora of black and white ensembles were strode down the runway, often on the favorite fringed black high heels. Giant zippers featured prominently on sleek black leotards and smooth, tight coats shaped the look into a compact picture of style. No color could be seen on these intrepid walkers, while leather featured prominently in nearly every outfit. Diesel designers took the opportunity presented by sheer black to allow delicate whites to show silently through. Denim even made an appearance, contributing to the “rock & roll” feel, studded and accented with lace to add flair to the ordinary. The subtle setting of this particular runway used careful lighting to introduce each model from the shadows in suspenseful allure. A shining silver stage added a beautiful accent to the dreaminess of the line and awed all names in fashion who attended. 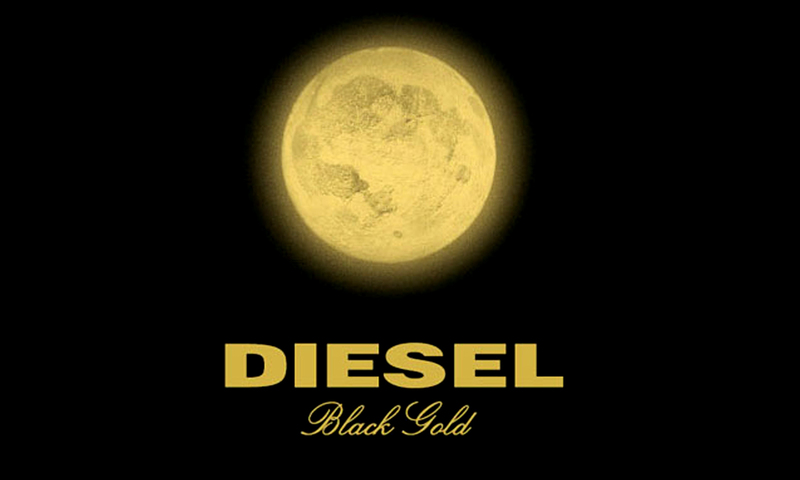 What’s ahead for Diesel Black Gold? Short skirts and long jackets to highlight them, with lots of leather to boot. The collection at the 2013 New York Fashion Week was described as “Urban athleticism meets uptown polish.” In a house that included celebrities Hilary Swank, Jada Pinkett Smith, Karolina Kurkova, Zoe Saldana and Michael Douglas, Kors sent out an array of outfits for his fall 2013 collection that ranged in color from royal blue to taxi-cab yellow. One look was a soft royal-blue cashgora jacket matched with a matching zipper skirt. Another was a black rubberized shaker-knit sweatshirt that was paired with yellow track pants with black leather stripes. The quilted leather skirt suit was a definite standout as was the men’s gabardine-leather toggle coat with rubberized pullover. Black menswear were nicely contrasted against colorful attires. The show also presented its fair share of evening-wear, including an elegant black mink slashed stole with a double-face zip skirt. The men collection emphasized on the overcoat, over-sized jackets and large pockets. The mixture of athletic wear-inspired textures and designs and cashmere cardigans gave a hint of glamour and sophistication. The chic and beautiful collection showed why Kors is still a respected name in the business after being around for three decades. The outfits on the runway were modern and sophisticated while still maintaining that look of comfort. Sleek structures and tailoring could be seen throughout the collection. 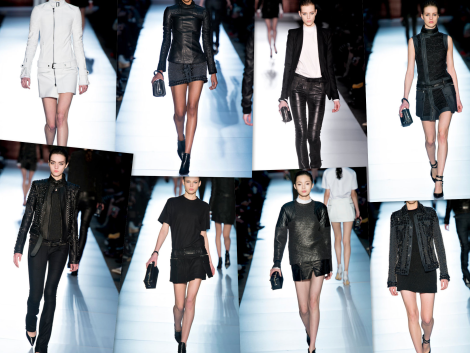 Bold belts and metallic accents as well as exposed zippers and leather detailing gave the collection a lot of edge. Reminiscent of his Spring 2013 collection, over-sized ski-like goggles was seen on few of the models. 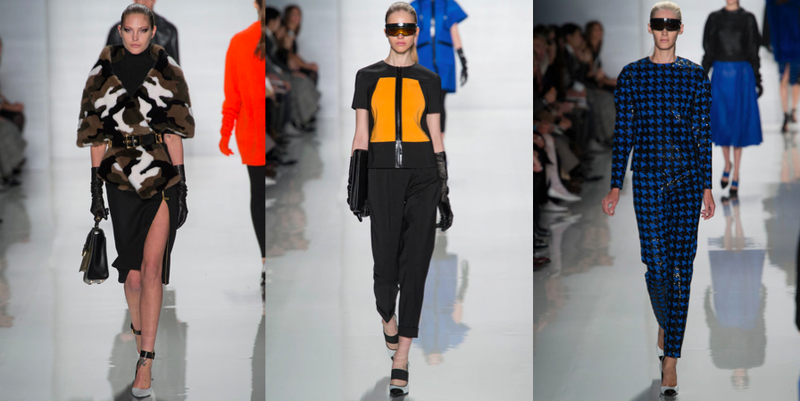 Kors use of colors and arrangement was indeed, “Bright lights, fast city…urban athleticism meets uptown polish,” as Kors himself described it. There was a good balance throughout the collection and had the signature sportswear look that Michael Kors is known for. As perhaps the most recognized name in luxury watchmaking, TAG Heuer may be lending their name within the world of sailing. Legendary Swiss watchmaker TAG Heuer will be joining forces with a young group of sailors in the 34th Annual Red Bull Youth America’s Cup, which will take place this summer in San Francisco, Calif. The young Swiss team will participate as TEAM TILT in the event. Comprised of six young men, ages 19 to 24, they will compete against nine other strong opponents for the title and coveted trophy. 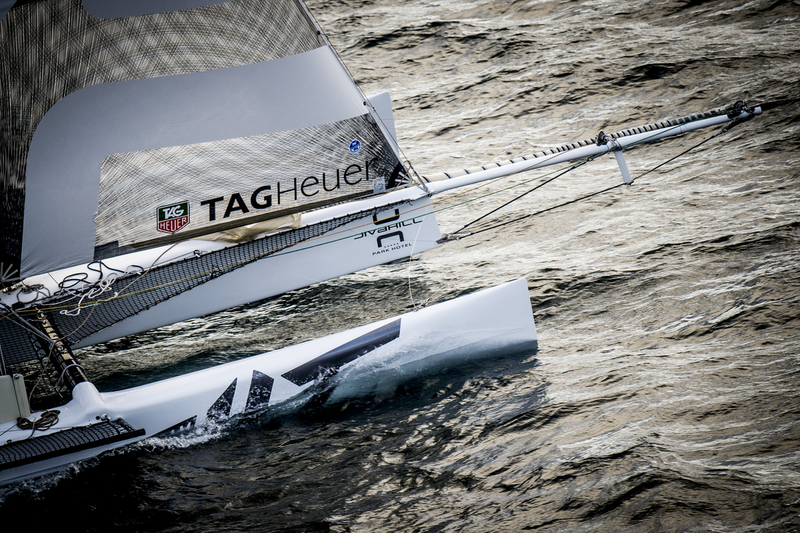 The Swiss team branded by TAG Heuer will be competing in a 72ft AC72 wing-sail catamaran sailboat and a 45ft AC45 class sailboat, a smaller version of the aforementioned. The smaller AC45 for their preliminary races, and the larger for the finals. The racers must face harsh conditions on the water- strong winds, waves and possible capsizing to claim victory for their country. Sailing on a 72-foot catamaran vessel has its own challenges without the added elements of Mother Nature. If all these challenges can be overcome and the young racers outwit and outlast their opponents on race day, sailing may become TAG Heuer’s new business front. Should the Swiss team knock off the defending champions, the BMW Oracle Racing team of Germany, then TAG Heuer will have much more to promote than fine wristwatches. When we first saw the ArtyA Werewolf Blood and Bullets watch this past Halloween, it made us want to howl– it definitely deserves mention. Although we were unable to cover it at the time, we thought it wouldn’t kill you to get to take a peek at such an interesting piece. And just in time to balance out all the Valentine’s Day chatter. At first glance, the ArtyA Werewolf Blood and Bullets watch shockingly pierces the mind’s visual senses and raises the question, “Are those bullets or two very ornate fangs?” Of course, after its shocking appeal dissipates, a closer observation reveals watchmaker ArtyA artistic expression of werewolf blood and silver bullets cleverly captured in a striking timepiece. The Werewolf Blood and Bullets watch roams the night (or day) with a 47mm wide steel watch case. The dial has two handmade silver bullets that have been forged, engraved and rubbed with garlic (a combo meant to kill werewolves) and disturbingly reveals the blood of a werewolf’s victim. 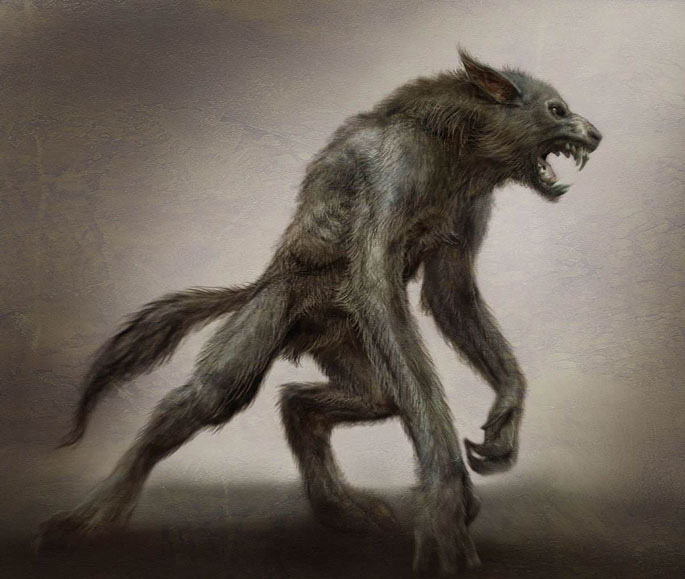 It contains an automatic Swiss Made movement to keep those willing to run with werewolves well aware of the time – be it under a full moon or the very eve of Halloween. The ArtyA Team is said to have manufactured this shocking timepiece under a full moon in Geneva (cue eerie music). 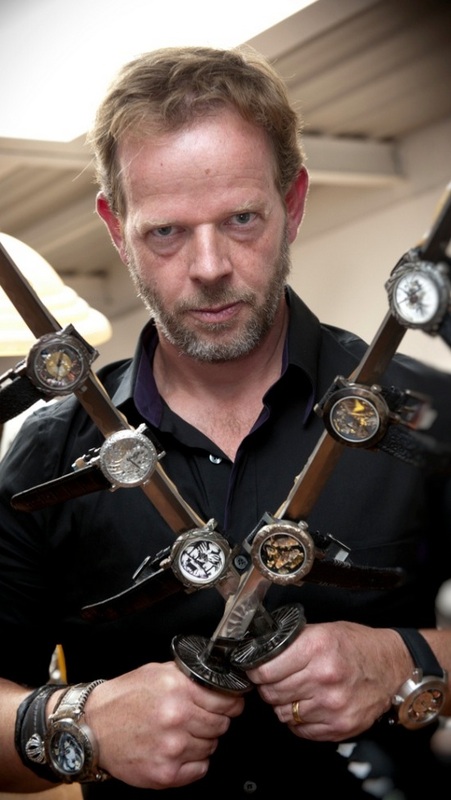 ArtyA founder Ivan Arpa’s wild avant-garde approach to watchmaking is literally changing the face of haute horlogerie. His watch designs have often been interpreted to border on the precipice of genius and insanity. Whatever the perception of the Werewolf Blood and Bullets watch, it is an undeniable piece of art. ArtyA timepieces are a perfect formulation of watchmaking and artistry. The watchmaker’s timepieces often contain genuine biological elements. ArtyA created a collection called “Farfalla” (Italian for butterfly). The dials of this collection were made from actual butterfly wings. Last year for Halloween ArtyA created a special Spider watch which contained an actual dead spider. Another watch that garnered quite a bit of discussion was a watch dial made of petrified dinosaur feces with a watch strap made of black cane toad skin, whose skin is poisonous while it is alive. It’s safe to say that the manufacturing of ArtyA watches while artistic, border on the shockingly bizarre as well. The Werewolf Blood and Bullets watch definitely measures up to ArtyA genius and insanity echelon. 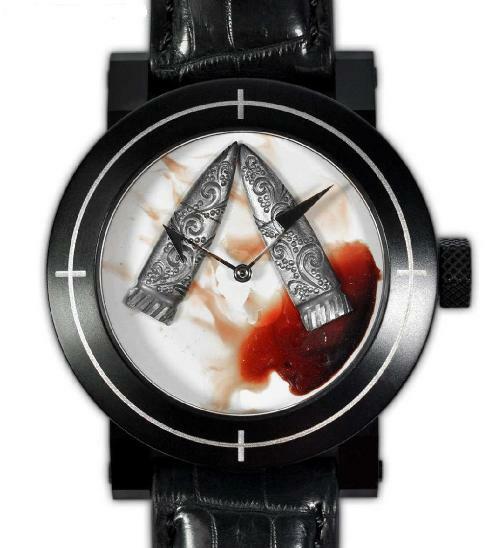 Collectors wanting to add a watch with both shock and artisitc value to their special collection will more than achieve it with the Werewolf Blood and Bullets timepiece. However, collectors beware; this watch has a bite that makes the time reading experience contagious! In May of 2012, a soldier in the U.S. Army was supposed to receive a care package from his family, of which contained a new Invicta brand wristwatch. The package never made it to the Lieutenant, as it was stolen from a postal worker at JFK International Airport. The CEO of Invicta, Eyal Lalo, heard about this story online and immediately took action. Through online social media and news networks, he was able to locate where the Lieutenant was stationed so he could replace the stolen watch. He did just that and more. Not only did he replace the watch that was originally stolen, but he sent the other 48 soldiers in the Lieutenant’s platoon an Invicta watch as well. All in all, Lalo sent out over $70,000 worth of watches overseas to show support for the troops, in this case stationed in Germany. Invicta Watch Group has been generous in many other situations as well. They helped found and operate the non-profit Invicta Care Foundation which provides aid to a multitude of causes. In 2005, The Invicta Care Foundation raised $127,846 to support disaster relief causes related to Hurricane Katrina. The donation was given to the American Red Cross to help those in need after the hurricane’s destruction. 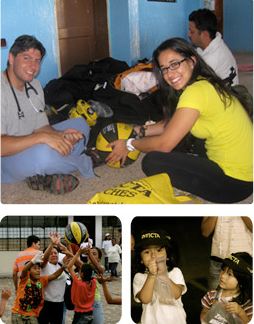 In 2010, The Invicta Care Foundation financially supported the Emmaus Medical Mission to help the poverty stricken community of Mindo, Ecuador. This kind of generosity tends to go unnoticed in such a busy world. Lately, with the economy being in recession CEOs of major companies are under alot of criticism for greed-induced actions in the public eye. The age of Occupy Wall St. strikes and protests are very reflective of the public’s view of big business. It’s refreshing to see the CEO of Invicta proving just the opposite with his numerous generous offerings. In the end, Invicta continues to make luxury watches here in the US- and you can bet the next time someone is in need or disaster strikes, CEO Eyal Lalo will be there to set a stellar philanthropic example for all big business to follow. margins for under $50, under $100, and under $200 every financial set is covered thanks to Fossil’s Valentine’s Day sale website. 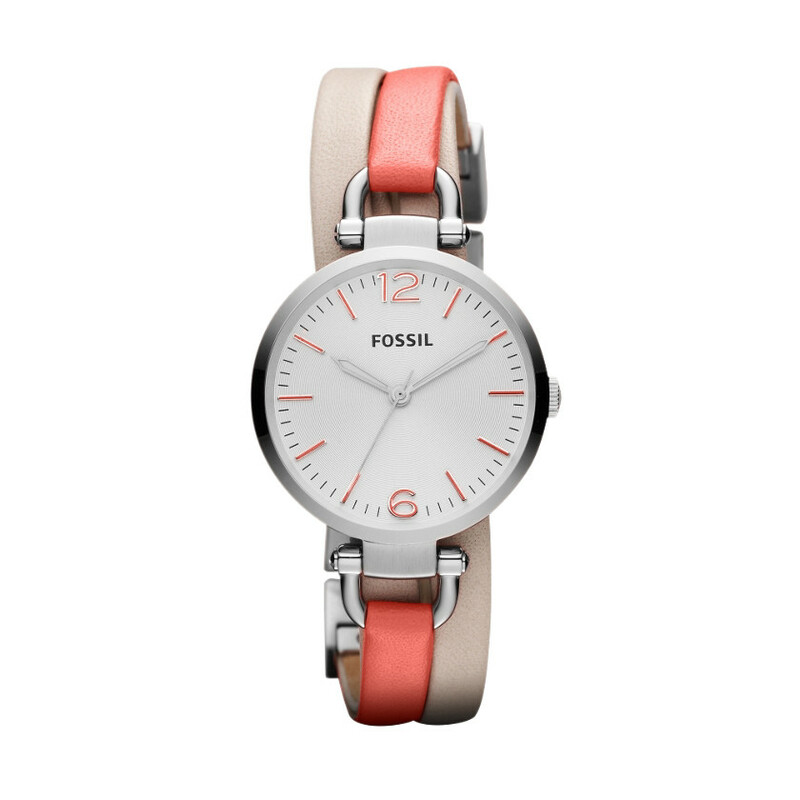 This year’s Valentines Day sale at Fossil is ranging from their well-known watches to belts, sunglasses, purses, and charm bracelets. 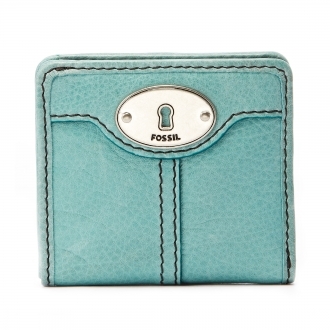 The under $50 selection at Fossil offers a colorful arrangement of charms, necklaces, purses, and other jewelry.The Marlow Bifold wallet, for example, comes in several bright colors and offers a cute and petite way to organize for only $35. Made with leather and jacquard lining, the Marlow style is also available in other forms, such as a slightly larger wristlet for $45. Or, if the lady in your life leans towards practicality in her gifts, one of Fossils many unique and brightly colored phone covers may do the trick. 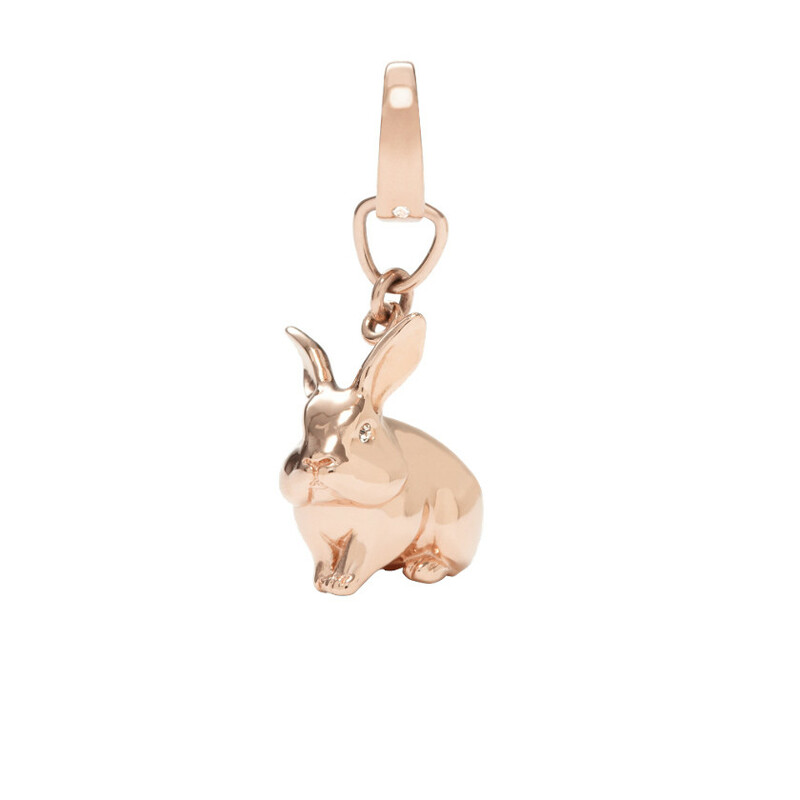 There is also an array of animal and floral themed charms available in the under $50 range, just right for anyone with a charm bracelet or looking to start one. Small, silver rabbits, hippos, bees, and dragonflys paved in crystals are all available from $24 to about $28. The next tier of merchandise costs around $60-$70, and boasts slick aviator and cat-eye sunglasses, leather flats, and belts. The Georgia Leather Watch, for example, comes in at only $75 with a shiny 32mm steel case and is offered in teal, white, and bone shades. For a little more ($95), the Heather Mini Stainless Steel Watch offers a classic look with its super-slim stainless steel bracelet and petite 26mm case in sand, brown, or grey. All water-resistant to 5 ATM (atmospheres), these watches will certainly enchant even the pickiest to buy for. statement pieces, reminiscent of refinement and tradition. 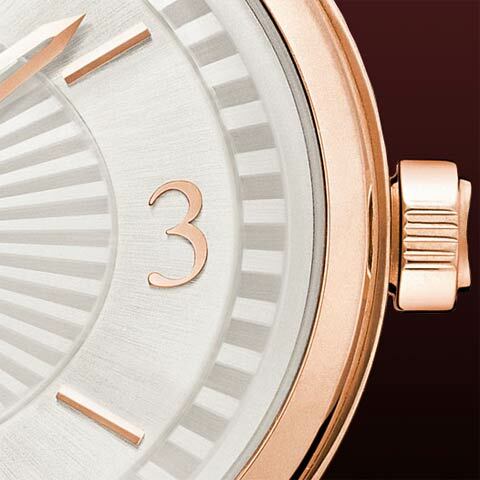 With its sparkling dial and rose gold color, the $135 Stella is a great investment into any couple’s future. 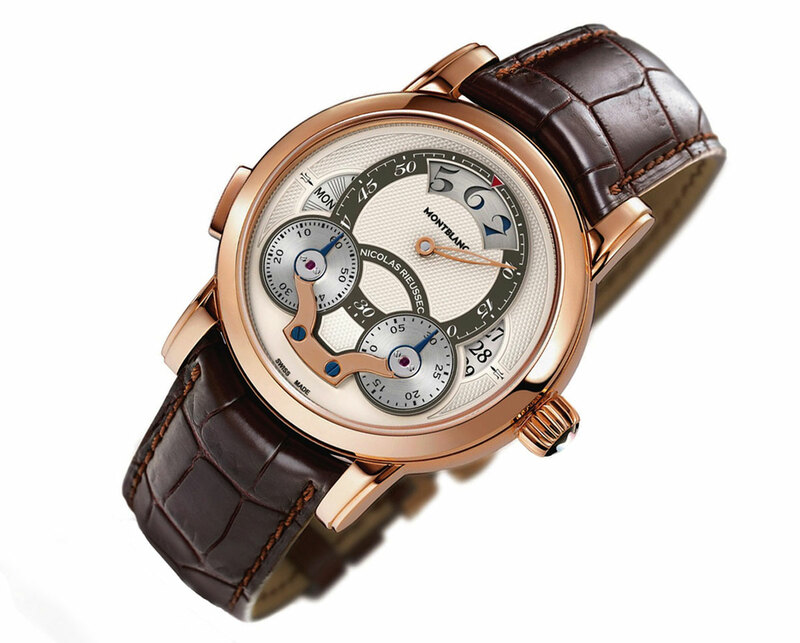 There is also the eye-catching Georgia Leather Watch, showing two contrasting leather straps winding around the wrist, with accents on the dial. The piece, at only $115, also boasts an Adjust-O-Matic closure on the strap to allow comfort for every wrist size. Aqua, cream, and chocolate colored leather purses and bags at this price tier also aim to please with their sophisticated yet chic presentation. The stress of getting the “right” gift can be very much lessened by this wide array offered by Fossil this year. Many items have been marked down by as much as $30, helping those who are set to save this year still impress their loved ones. 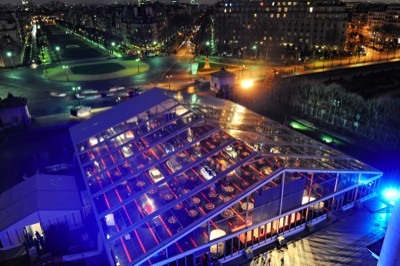 The 28th International Automobile Festival took off on January 29th, 2013 at the Hotel National de Invalides in Paris with the help of Bell and Ross. A brand known for its flawless designs, Bell and Ross was right at home. 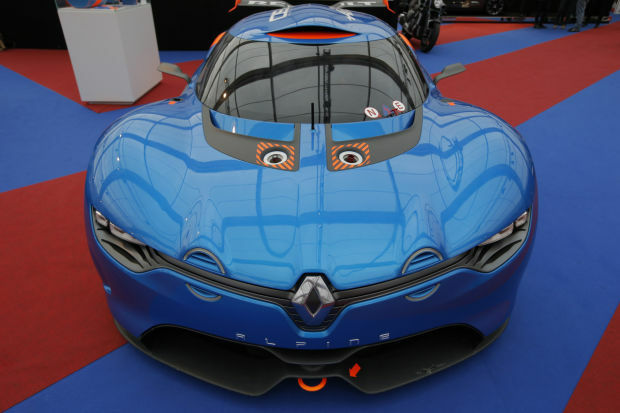 The International Automobile Festival is known for its high-end designs, trend-setting and setting new standards. This is why Bell and Ross was the perfect match to help host; each of those qualities pertain to their watches. Presided by Christophe Moulin, there were thirteen Grand Prix awards handed out throughout the evening. The CEO of Bell and Ross, Carlos Rosillo, was one of the judges and gave Jacky Ickx the Palme d’Or award. Bell and Ross was then able to use the event to show off their newest watch collections. 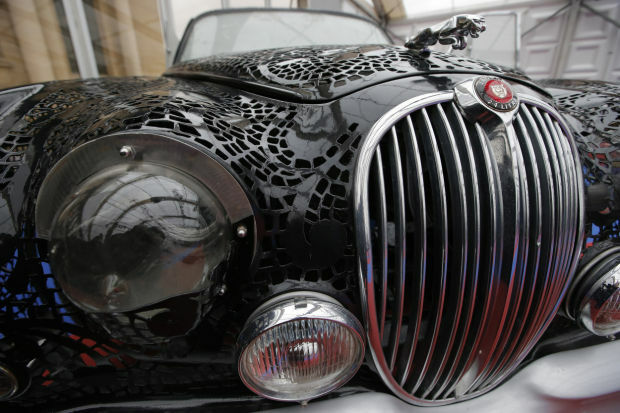 These collections were no doubt of high interest to the car lovers due to the matching mechanical advances in each. While the public was not welcome to the opening date, cars and watches were on display for them from January 30th – February 3rd. 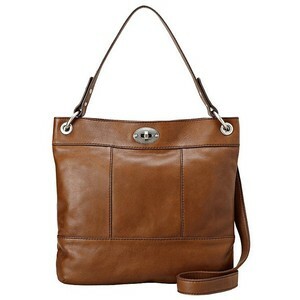 You can find information about Bell and Ross’ newest collections at www.bellross.com. If this Valentine’s Day you are looking for more than a chocolate and flowers kind of present, it’s time to consider one of the most quintessential gifts of love: the watch. Sure your guy might always be jonesing for video games and sports gear, but incorporate him into a life of romance with you and pick something more special. Nothing says manly and sophisticated like a classic watch. Business like or combat style, a watch can add nuance to his fashion choices and a become a treasured memento of your love for him. When you think romance, it’s easy to imagine something special and intimate, like the perfect watch complete with personalized engraving. Remind him or her of your favorite nicknames, quotes or place of meeting. List the lines to your song or make a promise that will last, maybe even longer than that smile on their face. Sometimes the simple and sentimental gifts are the best. 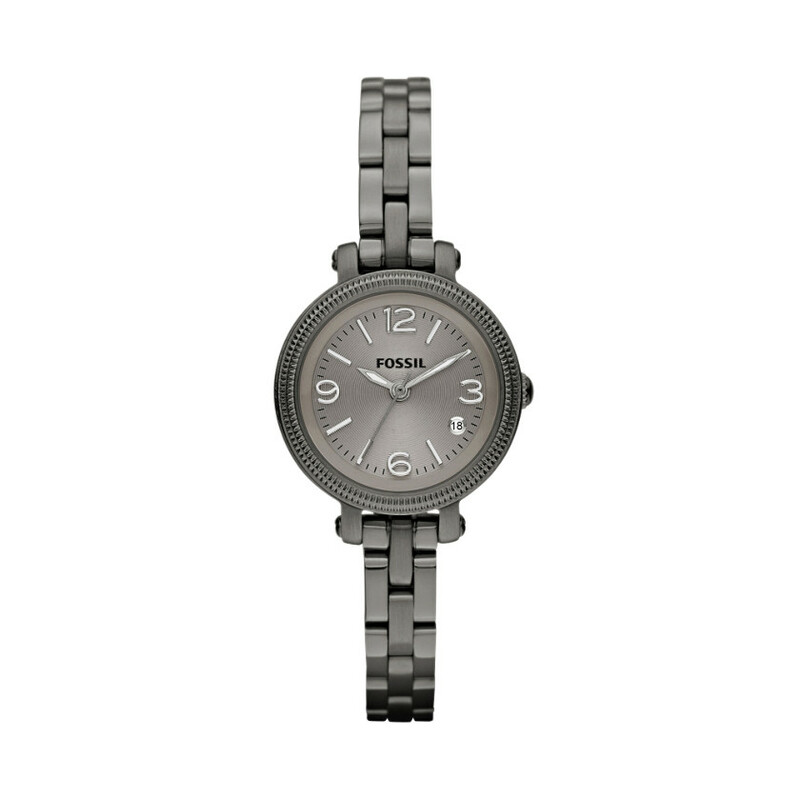 And giving your special someone a watch can say a lot about the timelessness of your relationship. Even better if you accent the gift with a few well chosen words. Count back to the moment you first knew you loved your person–or maybe to your first date to be safe–and write the amount in extended form in big letters on a card. For example: “I’ve loved you for 1,208 days, 3 hours and 34 minutes”. Play with the element of time to make a point and a memory that will be remembered throughout the rest of your time together. With a gift so classic, you can show your desire to honor both your relationship and the quality of timelessness you see in it. Start traditions to complement the elegance of your time together. Set a time, perhaps 11:11 or the corresponding dates of your anniversary, and agree that no matter where you are or what you are doing, you will think of your partner and smile. Create a tangible link between you to represent the forever connection you share. Time is that ever elusive and always illustrious factor in our lives. Choose to give the gift of a timepiece and with it an increment of time together to match every number on the dial. 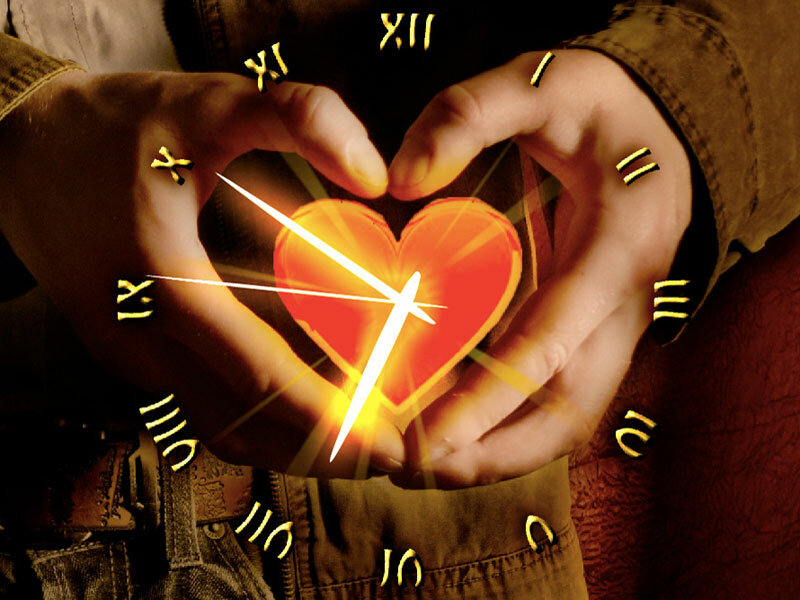 This holiday, show you will treasure his or her heart throughout all time and for longer than that glowing new watch will tick. The Salon of Haute Harlogerie of 2013 played host to a myriad of gorgeous watches. Amidst the intricate calibres and stunning watch faces, the new Montblanc Nicolas Rieussec Rising Hours stood out as one of a kind. Much about this watch speaks to a trending away from traditional watchface appearance. At first glance this appears as more of a tool for navigation than a simple timepiece. The hours roll by at the top, the twelve daylight hours between 6 a.m. and 6 p.m. in black and the other twelve in dark blue. It is the minutes that are carefully ticked off at the largest dial, set above and between two small dials that count the seconds. The 3 and 9 places proudly elucidate the date, and information is so carefully placed that it successfully creates a symmetrical piece of art as well as a functional piece of jewelry. 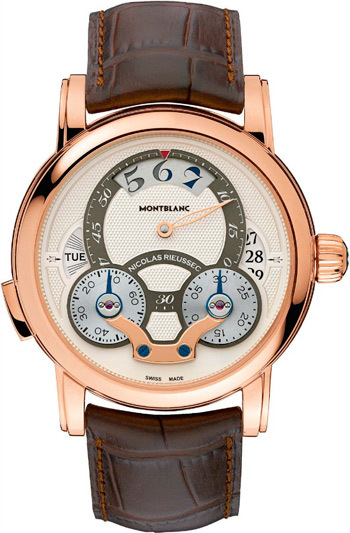 This Montblanc watch is part of the Nicolas Rieussec collection, a line named for famous French watchmaker credited with the patent for the world’s first chronograph in 1822. The Rising Hours has a name deeply imbedded in its own style, as the center and largest dial rises from between the two smaller dials, deeply evocative of a rising sun or star and hence a remarkably appropriate title. The hunter green and deep blue hues surrounding the dials in this watch work with the gold of the frame and brown of the strap to create a look that is quite striking. The refreshing colors provide a feel that is refreshing and accessible to a variety of differently styled watch wearers. Seldom are such bold shades used together, yet the daring genius of Montblanc earns all the approval provided by the SIHH. Indeed, the Montblanc Nicolas Rieussec Rising Hours was a star at its apex to Geneva’s adoring crowds and its orbit of glory seems likely to continue on.